Spooky season is upon us! Before we know it, we’ll be dusting off our Dracula capes and witches’ hats. To get you in the spirit before you attend our Skegness Halloween events, we thought we’d share with you the origins of Halloween in the UK. If you love Halloween as much as we do, you will have probably watched every spooky movie going and learnt all about ‘All Hallows Eve’. Whilst there is some truth to these much-loved films, it is widely believed that Halloween can be traced back 2000 years to the festival of Samhain. What is the festival of Samhain? Celebrated on the 31st October, Samhain was an ancient Celtic festival when the UK was occupied by the Celts. It marked the end of summer and the beginning of the harsh winter days to come. This changing season symbolised the boundary between our world and that of the dead. The Celts believed that on this day ghosts could cross over to the mortal realm and walk among us. To ward off any evil spirits, the festival would include lighting bonfires across the villages to keep them away. The traditions of Halloween have changed since then, but we can still see echoes of the old traditions weaved into our own. Carving pumpkins into lanterns to ward off evil spirits combines this ancient Samhain ritual with traditions brought over from America, along with trick or treating. Also, the belief that ghosts could walk among us sparked the tradition of telling ghost stories, some of our other Halloween traditions were brought by new settlers who came to England. Did you know that the tradition of apple bobbing can be traced back to Roman settlers in 43AD? After the Romans conquered England, they assimilated their own traditions with the Samhain Festival and this new tradition was born. All Hallows Eve started in the 5th century when Christianity began to spread throughout the UK. Originally celebrated on the 13th May, All Hallows Eve was known as a day to remember those who had died for their beliefs. During the 8th century, Pope Gregory changed the date to Halloween as he wanted to combine this day with the Samhain Festival of the dead. Whether you believe that Halloween is a night where ghosts walk free or not, it’s safe to say on the 31st October, something spooky is in the air! 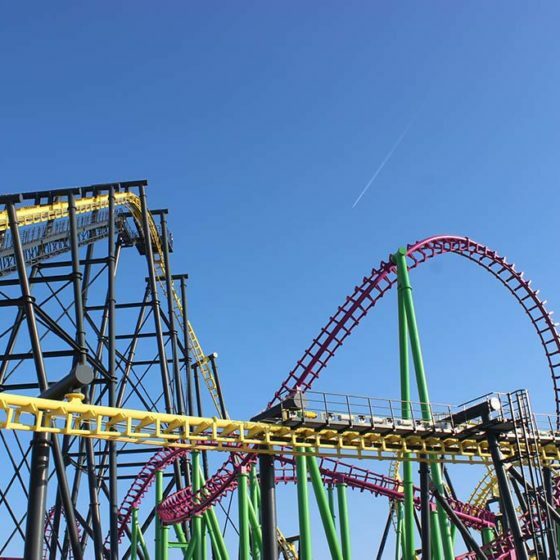 Be sure to visit Skegness and Fear Island at Fantasy Island this year for an evening of fun and entertainment.